Speedier and more flexible - but is it worth the upgrade? There's a brand new Firefox in town: Firefox 3.6. It's not a huge update, but it does offer improved performance and stability together with some interesting new features. One of the most important changes is improved support for HTML5, the next generation of the language in which the web is written. That enables two particularly eye-catching things: the ability to watch streaming video without installing a plug-in, and support for the HTML5 File API, which means developers can use dragging and dropping between browser and desktop. PLUG-IN HELP: Firefox will now tell you if plug-ins are out of date, reducing your potential exposure to some security threats. With video, Mozilla's timing couldn't be better: YouTube and Vimeo have both announced HTML5 video players that dispense with the need for Adobe's Flash. Unfortunately neither player currently works with Firefox 3.6. That's because of a schism in the HTML5 world, with Mozilla plumping for the open source Ogg Theora codec and other browsers supporting H.264 encoding instead. Google's Chrome supports both, but YouTube doesn't - and that, plus widespread H.264 support elsewhere, means that H.264 already looks like the winner in this particular format war. What else is new? There's built-in support for Personas, which enables you to choose from tens of thousands of unpleasant browser themes. That's maybe a bit unfair on Windows, where Personas look pretty nifty, but on the Mac they're consistently hideous. 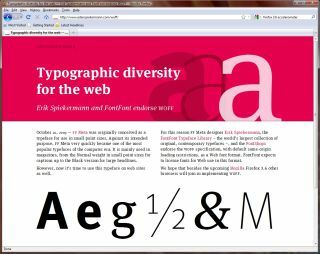 More usefully there's support for the WOFF web font format, which enables print-style typography online. The browser now checks whether your plug-ins are out of date and warns you accordingly, which can help reduce the risk of browser-based exploits. And if you've got a laptop or tablet computer with an accelerometer in it you control the browser by tilting your PC. If you're paying really close attention you'll also notice that when you open a new tab it appears next to the current one, not to the right of every other open tab. It might be a little change but it makes things much less confusing when you've got tens of tabs open at once. It is, however, closer to Chrome's performance than ever before. In the Sunspider benchmarks Firefox did the tests in an average of 1730ms, compared to 930ms for Chrome. That's more than four times faster than IE8, which wheezed through the same benchmarks in 8436ms. The browser also supports asynchronous scripts, which means web designers can essentially say "this script isn't that important; render the rest of the page first and then come back to it." Both changes should mean speedier real-world browsing. Overall, then, this is a worthwhile upgrade. It's not revolutionary, but it delivers a host of improvements in speed, stability and support for emerging standards. It might not be pretty, but it's pretty damn good.